Cleveland, OH – 8/29/14 – On August 20, 2014, Solus Lighting LTD was honored with an esteemed ISES Esprit Award in the category of Best Event for a Non-Profit Organization for the Building Dedication on World AIDS Day. In its nineteenth consecutive year, the ISES Esprit Awards program has a rich history of honoring excellence in the special events industry. Established in 1995, the awards recognize influential contributions that impact the advancement of creative events and reward those individuals whose vision and creativity make their events exceptional. This is the fourth accolade Solus Lighting LTD has been honored with this year, having won awards earlier in 2014 for innovative event lighting for Best Wedding, Best Team Effort, and Best Public Event. 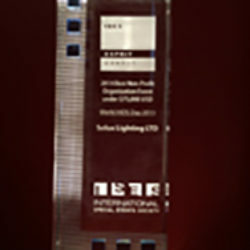 These recognitions are a clear indication of the creative vision and unsurpassed customer service Solus Lighting LTD provides. The International Special Events Society (ISES) is the world’s largest community of event professionals. ISES members are dedicated to deliver creative excellence and professionalism for special events. The mission of ISES is to educate, advance, and promote the special events industry and its network of professionals along with related industries. ISES strives to uphold the integrity of the special events profession to the general public through principles of professional conduct and ethics, acquire and disseminate useful business information, foster a spirit of cooperation among its members and other special event professionals, cultivate high standards of business practices. To learn more about the International Special Events Society, visit www.ises.com.